Individual does not hold current, active SB CAMFT membership. Individual holds active SB CAMFT membership and is current with membership dues. This member benefit is available to current students who hold active SBCAMFT membership. This individual is a current student and does not hold active SB CAMFT membership status. A registration code is required to access this discount. Please see your student adviser for the code if you are eligible to receive this discount. *Although current students are eligible for a discount to this SB CAMFT event, current SB CAMFT members get the lowest discounts all year round. Just one of many benefits of joining SBCAMFT! To join our chapter, please visit, www.santabarbaratherapy.org and click on the "Membership" tab. There are membership special rates for pre-licensed and students. 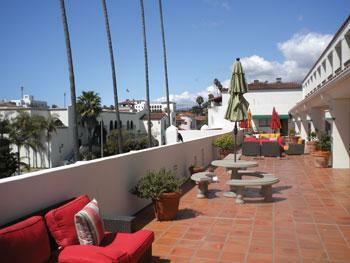 Come socialize with your colleagues and take in sprawling views of Santa Barbara on the beautiful rooftop patio at Antioch University! This fun-filled, sunset event will include live music by Jaymee Carpenter, delicious appetizers catered by El Zarape and wine from Pali Wines. Connect with your peers! Bring your business cards, marketing materials, winning smile, and natural warmth. What better way to end the week? This is one of SBCAMFT's most popular events of the year! You don't want to miss it! Advanced registration is highly recommended! Guests are welcome! Thank you to our generous sponsors Antioch University & Good Heart Recovery! *You must register and pay online using the link below. Only registrants with fully paid and completed registration will be guaranteed admittance. Tickets will only be sold at the door at full price (no member discount) if space is available. * All sales are final. Unfortunately, due to catering minimums based on the number registrants SBCAMFT is not able to provide refunds. *Please remember, food provided are appetizers and snacks, not intended to be a meal.